A classic fit suit is quite often referred to as a traditional fit suit. It is highly characterized by the comfort that it brings, in addition to the fact that it is very easy to wear. These types of suits are also known to be cut generously throughout the waist and chest area. This cutting style is the reason behind the possibility of being able to move freely, with less constriction for the body movement. It makes sure that you still keep that clean shape or your body. 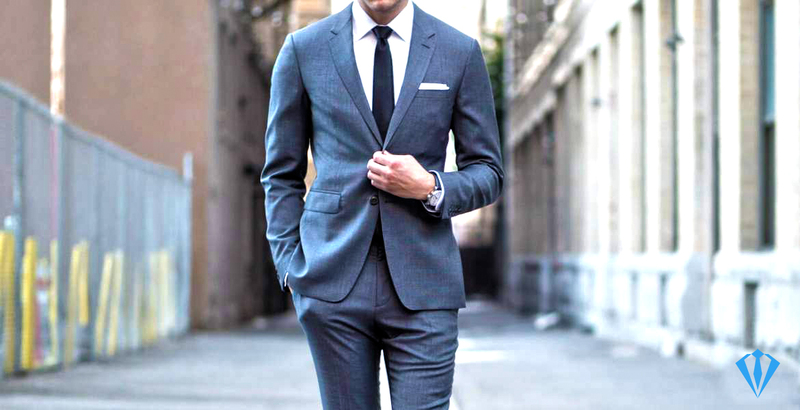 Classic fit suits are known to provide clear, overall masculine silhouette. They are very comfortable to wear, ensuring that there is no compromise to the style. These are also the types of suits that are easy to fit and perfect for everyday wear. The style is usually cut using a comfortable shape, which is highly guaranteed to make you look really stylish and smart. Besides, they are perfect for men who are always on the go and need a particular everyday suit that can easily sustain hardworking usage. 2.1 Which One Should You Choose? 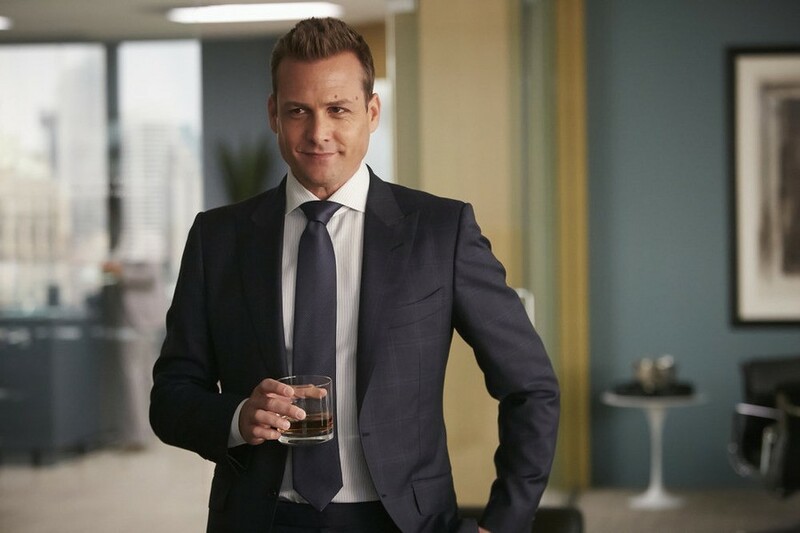 Why should you pick a classic fit suit? There are lots of reasons. Firstly, they’re easy to find. Most stores will stock this particular cut, so you’re bound to find one to match your budget and your size. Also, if you’re an unusual size or shape, they’re one of the easiest styles for a tailor to adjust. A classic fit suit is great for men who aren’t comfortable in a slim fit style and who prefer a more timeless look. The classic shape is never out-of-date and is ideal if you only wear a suit once a year. Classic suits offer a time-honored fit that’s ideal for everyday wear. Plus, they are suitable all-weather wear for every season. You can easily slip a warm waistcoat underneath for an extra layer in colder weather. 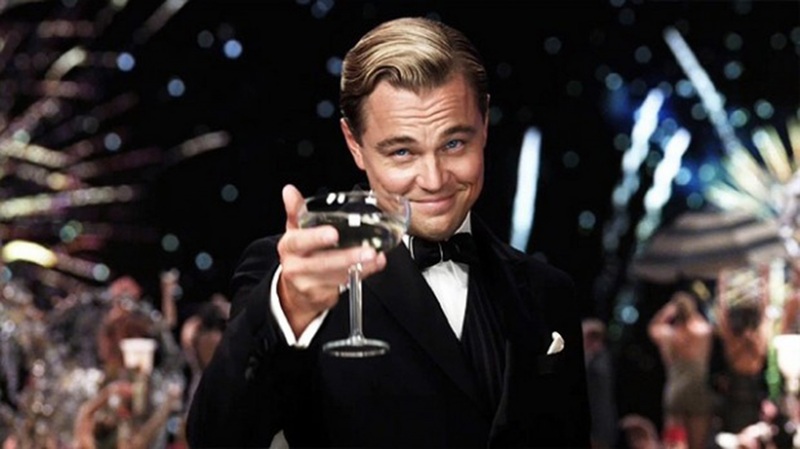 Every guy who cares about his appearance should have at least one classic fit suit in his wardrobe. And if you wear suits to work, you’ll probably need this timeless cut in various colors and different materials. Nowadays, you can get classic fit suits in crease-resistant fabrics that don’t even have to be dry-cleaned. How’s that for making your life easier? Men’s classic style is all about the detail. It’s the little touches that are going to express your personality and sense of style. Here’s where your suit buttons come in. Look for a classic suit with buttons made from quality materials such as wood or bull horn. This will immediately set it apart from lesser suits with plastic buttons. The number of buttons you choose is also important and can make a big difference in how your suit fits. Although one and four button suits are available, most classic suits will have two and three button jackets. Two buttons tend to be more flattering because of the low placement of the buttons. This makes the lapels longer, which visually lengthens the torso and slims the figure. So, if you’re on the short side, a classic fit suit is the obvious choice for you. It’s also the best option for portly gentlemen who like to look a little slimmer. Three button suit jackets are considered more old-fashioned and slightly eccentric but in a good way. The button placement is higher, giving the front of your suit a shallow V-shape when buttoned up. Three-buttons do not have the lengthening effect of a two-button jacket. They are best worn by taller guys looking for a more proportionate and balanced effect to counteract their height. However many buttons you choose for your jacket, always, without exception, leave the bottom button undone. Suits are deliberately cut to be worn with the bottom button undone. Fasten the button, and you’ll spoil the shape. You’ll also appear a little nerdy because this is a long-standing tradition. It goes all the way back to King Edward VII who was too fat to do up his buttons. As a result, society followed his lead, and the trend continues to this day. Talk about a fashion icon! Classic suit jackets are cut with broader shoulders. They have more room around the chest and waist than their slim-fit counterparts. The armholes and sleeves are also a slightly wider cut. A classic fit jacket is a little longer than other styles and is less taken in at the waist. The pants are relaxed around the thigh and seat area. They’ll fit a little wider too, in order to maintain a well-balanced appearance. The waistband fits around the natural waist and should not require a belt to hold them up. That said, a classic fit suit should never be baggy. To learn more about how a suit should fit, we strongly advise you to read the complete guide on how to fit your suit. You can either wear the matching pants and jacket together or mix things up a little. For a more business-like, traditional appearance, the jacket and pants should match in color and material. For an offbeat, bolder look, feel free to mix colors and textures. Bear in mind though that it’s probably best to wear neutral shades together and lighter colors together. Keep a black classic fit suit for funerals and weddings, and always wear black shoes with it. For day-wear, navy and charcoal grey are your go-to colors. Add dark brown shoes and a shirt in almost any color to look sharp and stylish, without overdoing it. What about suits in summer? Navy and charcoal grey work anywhere, anytime. But it’s nice to have a couple of lighter shaded suits for the warm weather. They’ll reflect the heat and create a fresher appearance overall. Try light grey with a powder blue or white shirt. Blonde or grey-haired gents will look sophisticated in a baby-blue teamed with a white shirt. Khaki is also perfect for summer but keep it for daywear as it’s not as formal as other colors. When autumn comes along, rich burgundy or berry shades make a statement while still being classic. A white shirt and black shoes pair well with these colors. Your classic fit suit is ideal for so many occasions you’ll probably discover you need more than one. Here are just a few examples of when the classic look is never out of place. A classic suit in traditional colors like navy, charcoal, medium grey will always look professional and polished. Plus, the classic fit will ensure you’re comfortable throughout your busy day. It will take you effortlessly from your office to the boardroom. Then out for dinner and drinks with clients. If your business is slightly more casual, wear your suit pants alone with a dress shirt and vest. Or wear your trousers and jacket with a polo neck sweater. Your date is sure to be impressed if you show up in a classic jacket and trouser combination. If you don’t wish to be quite as formal, exchange the suit trousers for a pair of dark, well-fitting denim jeans. You can also show off the playful side of your personality. Simply wear your classic suit with a vibrant colored or a patterned dress shirt. These are the perfect time to pull your suit out of mothballs. A black suit and white dress shirt are traditional for formal occasions, but if you have the confidence, you can veer off the tracks a little here. Feel free to experiment with jackets in unusual fabrics, such as velvet in a dramatic color. Finish your look with accessories like bow ties, patterned neckties or interesting, eye-catching shoes. Outdoor functions generally have a casual ambiance. But there’s a lot of occasions that still require a classic suit. For a day at the races, for example, or a formal, corporate picnic. Pick a suit in a lightweight fabric such as cotton or linen. Wear lighter colors in neutrals or pastel shades. Keep your shirts pale too, and you’ll cut the perfect outdoorsy figure. 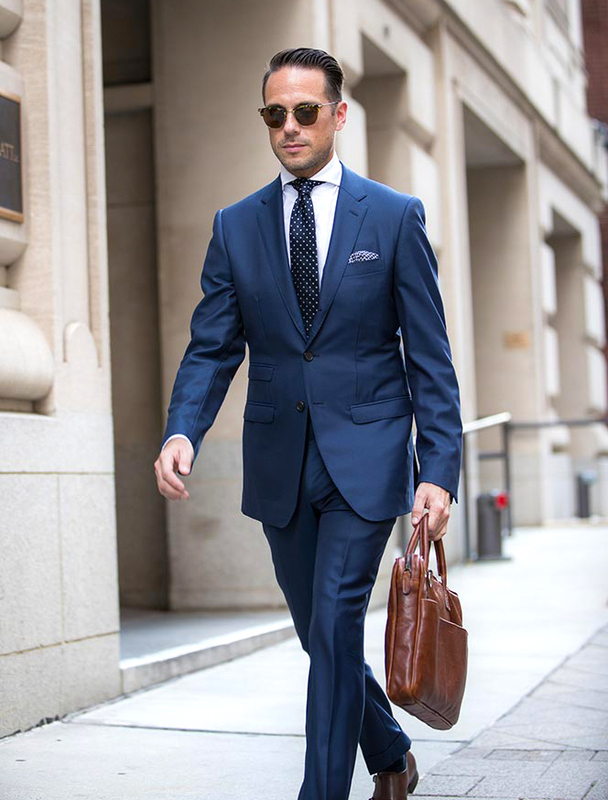 This classic fit suit is available in several colors, including brown, blue, light blue and charcoal. It’s made of wool (52%), polyester (46%) and spandex (2%). Do a dry-clean only. Keep in mind that the jacket doesn’t have exterior pockets. 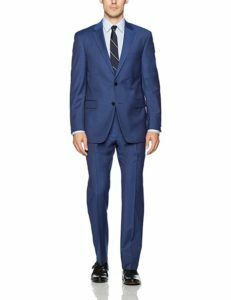 As one of the bestsellers in the classic fit suits category, more than 75% of the people rated the size and the model as perfect. The pants have a flat front with a stretch waistband. Perfect for business and everyday occasions. This suit from Jones New York is made of 100% wool. Jacket features two-button placket, notch lapels and side vents. The pants are flat front with side-seam pockets. As such, it should only go through dry cleaning. It also comes with a flat front pant which is lined towards the knee. This suit is available only in black color. Match your perfect size using the size chart guide next to the size selection. This two-piece classic fit suit comes with a two-button jacket equipped with side vents and buttoned notch lapel. It also has a flat-front pant and jetted back pockets. This suit is made of 78% polyester and 22% viscose. The jacket comes with flap front pockets, together with welted chest pocket. 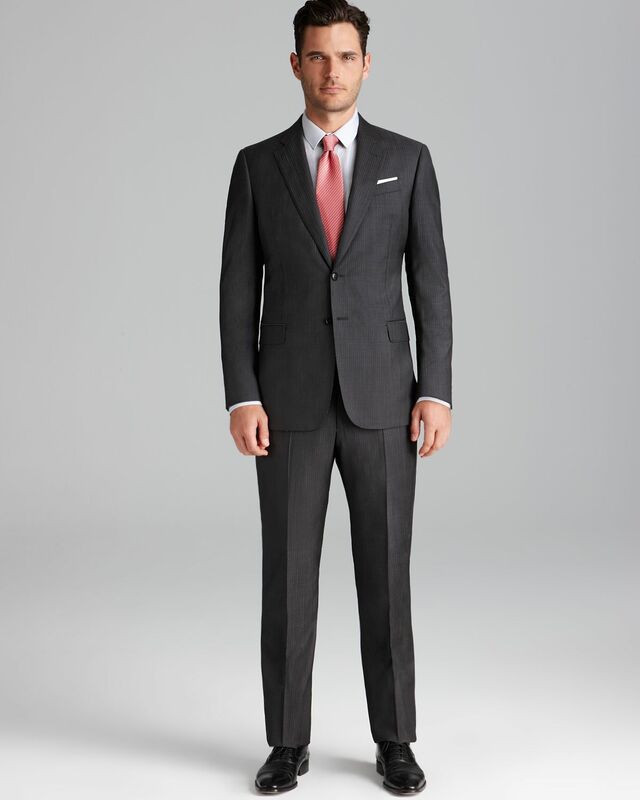 Calvin Klein’s classic fit suit is made of 100% wool. Therefore, it should go through dry clean only. The jacket comes with side vents, notch lapel and two-button closure. Additionally, the suit jacket includes a double besom and external chest pocket at the left side, along with four-button cuffs that are partially lined. This suit is made of 98% wool and 2% spandex. It should only go through dry clean so as to maintain quality. In addition, the jacket comes with two-button closure, side vents, notch lapel, and front flap pockets. Pants features include a flat front and a zip fly with button. They have a back button-through welt pockets and are partially lined to the knee. The hem is unfinished, though. This suit features two-button closure, notch lapel, two vents, as well as a stunning classic fit design. It also comes with a matching classic fit, flat front pants and unhemmed bottom, which enables you to customize the best pant length according to your taste. It is made using imported European fabric. The modern double side vent design gives you comfort and breathability. Everything you can expect coming from the highest quality and most expensive suits. As an Italian Design Super 150s, it is made using high standard fabric wool touch. This classic fit suit is therefore only good for dry cleaning, though. The material is very soft, offering a great look and feel. As a suit made in the quite extraordinary and elegant design, this model is perfect for any formal event, or any occasion which requires formal looking attire and appearance. If you are looking for a classic fit jacket only, these are some of the bestseller listings in the shops. They are pairable with most of the pants and can be easily mixed with. This classic fit suit is made out of 65% polyester and 35% rayon. It is also recommended for dry cleaning only as regular machine wash may damage the fabric of this suit. It also comes as a two-button coat. A lot of customers are pretty much impressed with the quality of this suit, both the jacket and the pants (they come separately). The fabric construction makes it possible for the wearer to feel comfortable, as they were not too hot and can breathe really well. The pants that are usually combined with this jacket are made of 70% Polyester and 30% Rayon. Additionally, they include a flat-front silhouette and slant pockets, a zip fly with button and are wrinkle resistant. This suit is made of 65% cotton, and 35% viscose, and comes in Navy color. For maintenance purpose, this suit should only go through dry cleaning. It comes with a classic two-buttoned suit jacket, equipped with notched lapels that features front flap pockets, as well as side vents. Classic fit suits are the go-to outfit for any man who likes to look great without spending too much effort. Once you have the right fit, it’s easy to find fabrics and colors for any occasion. And you can rest assured, you’ll never be caught out of style. 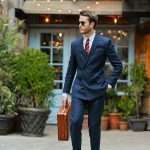 Indeed, there are several options that you can take into consideration when it comes to selecting the best classic fit suit. Classic fit suits are certainly recommended for you if you are the type of person who prefers a comfortable cut and wants to be able to move around freely at work. There are different colors that you can choose from, as well as extra features that are unique with each model. The first option on the list, the classic fit suit by Tommy Hilfiger is the best option by far. It has also received the most positive feedback from different users and reviewers. The size of the suit perfectly matches the buyer’s expectations. However, the other options are promising, too. Therefore, take the time to find out what your needs are first before you make a decision which classic fit suit you should buy. Check the features that you want to see in a classic fit suit, too. Compare what you want with the options that are available, including the items that are included in the list above.